Why Select Indigo ELN as Your ELN? Entities search by attributes and Structure/Reaction search. Reagent search in internal and external databases. Indigo ELN is a viable free-of-charge alternative to commercial electronic notebooks providing the same set of functionality. The core Indigo ELN product is free of charge, as it is distributed under open-source GNU General Public License, Version 3. Total integration costs are much less than the licensing costs of commercial products. Indigo ELN represents a leading cost-effective alternative to commercial ELN products. Indigo ELN v2.0 is a Web-based solution with a multi-tier architecture. The core Indigo ELN v2.0 product is shipped with basic services included. Integration with any external service requires just develop new component without need to change core code and architecture. EPAM is available to implement any requested components, services and to integrate the solution into your infrastructure. Database tier - MongoDB (In addition, Indigo ELN supports EPAM`s open-source molecular search service BingoDB). 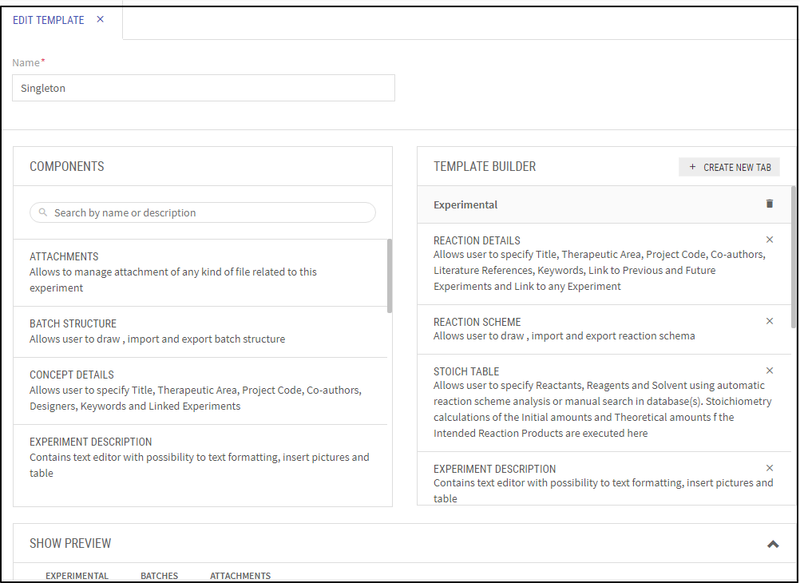 Core user interface for creation of Projects, Notebooks, Experiment templates and Experiments. 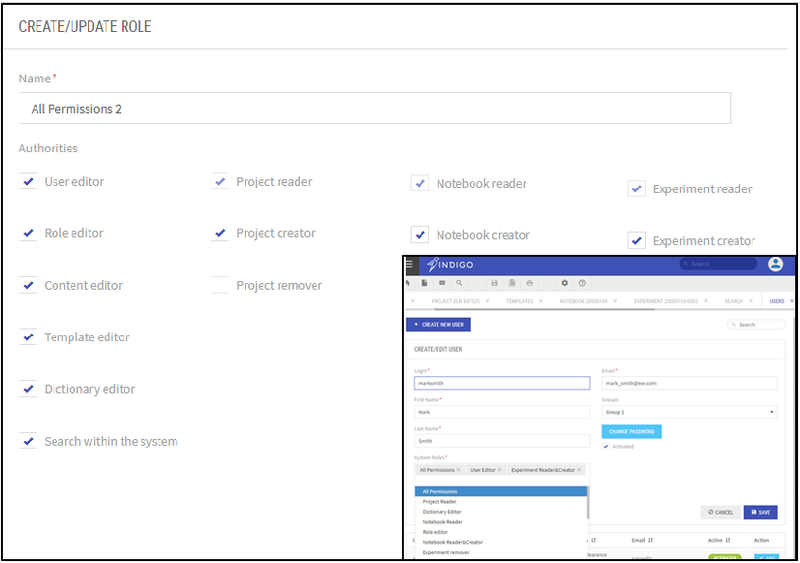 Basic functionality and user interfaces for creating, describing, searching and managing entities: template, experiments, notebook, projects. Reaction rendering and chemical properties calculation based on EPAM`s open-source cheminformatics engine Indigo. Integration with EPAM`s chemistry drawing tool Ketcher. Basic compound and batch registration service (These can be adapted to meet your requirements). Service for integration with Signature application to sign and witness experiments using internal certificate. Integration with service used SAFE BioPharma standard for signature is also possible. 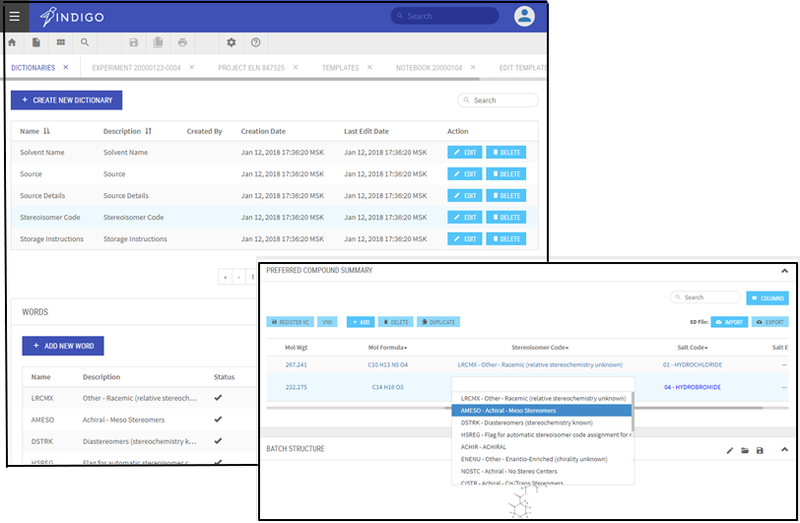 Indigo ELN v2.0 supports User Access Management that allows refined customization of access levels for users and groups inside the whole system and to individual Projects, Notebooks and Experiments. To ensure this flexibility, Indigo ELN supports a User-Role-Authority model on application level and ACL (Access Control List) for entities (Project, Notebook, or Experiment) that contains User Permissions for a user. This means that Administrator can define which actions are allowed for a user on the application level. Users can share entities with various permission levels, and the visibility of such shared entities depends on user roles. Each user is assigned a role or a set of roles each containing a set of Authorities. The final set of privileges for a user is formed from a distinct set of authorities coping from all user’s roles. Hierarchy of entities consisting of projects, notebooks and experiments allows users to systemize their research work, provide additional information about ongoing projects and separate different topics inside one study. 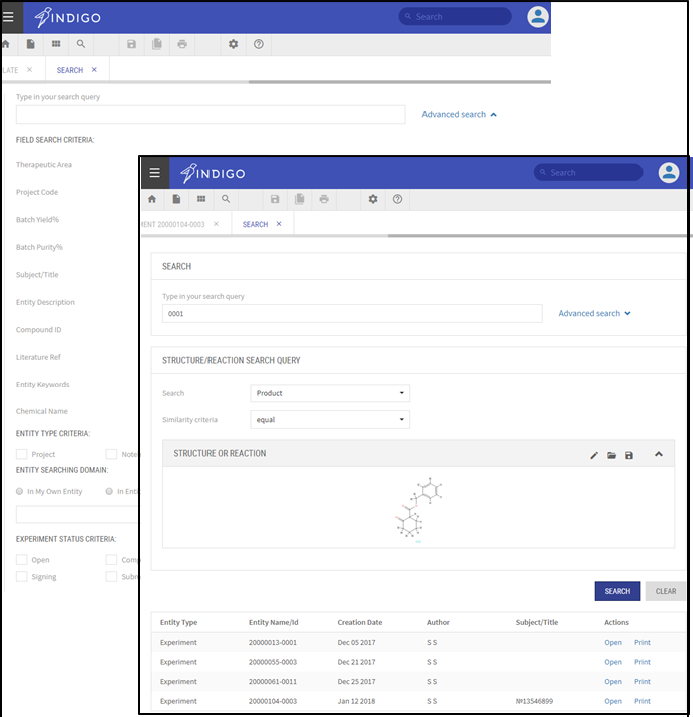 Indigo ELN provides users with the ability to create custom templates for experiments to be able to suit numerous chemical research designs. Templates become available for many users to apply to their experiments. Experiment may include only experiment design or just a concept record, or both - all depends on the users` choice. Experiment Template can be constructed using components. The current components library allows supporting single step chemical reaction, future synthesis idea, including chemical structure information, or just a textual description. The list of components is expandable without the need to change the core code or architecture. Indigo ELN`s advanced algorithm for searching inside the system offers a wide range of queries: entity type and attribute, entity domain, experiment status. 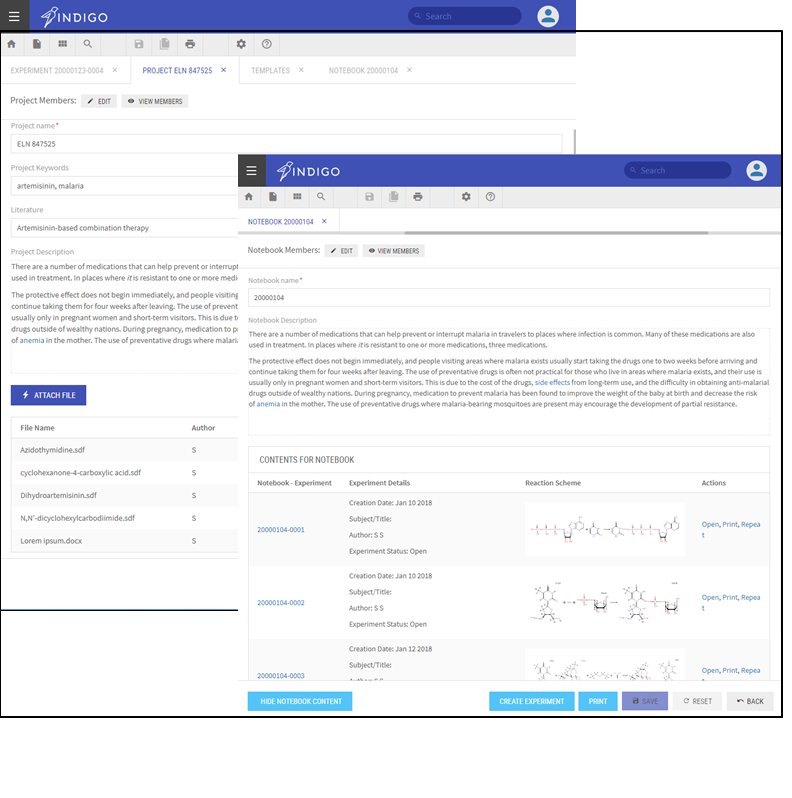 Integration with Bingo DB enables Experiment search by Product structure or Reaction scheme. 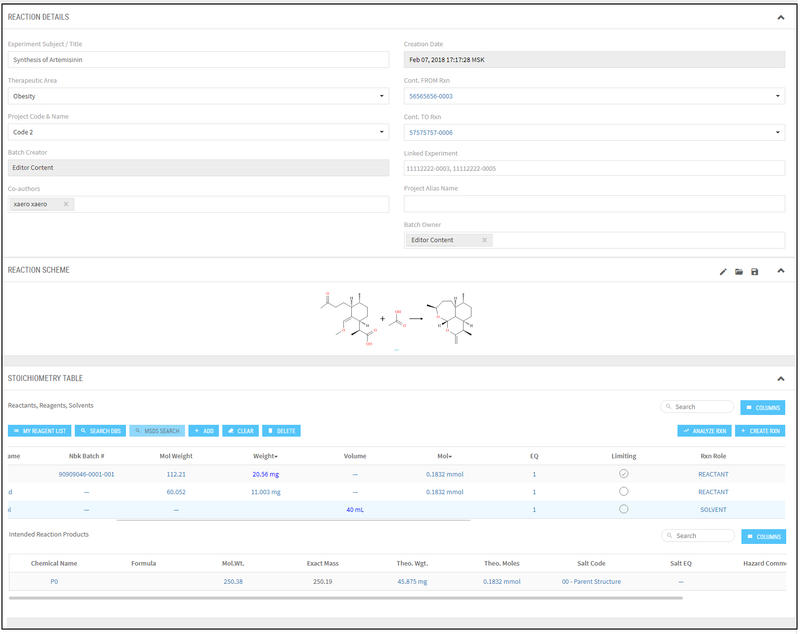 Stoichiometry Table Component has Reagents Lookup Catalog functionality that provides search for Reactants, Reagents or Solvents created inside Indigo ELN database or in External databases integrated with Indigo ELN. 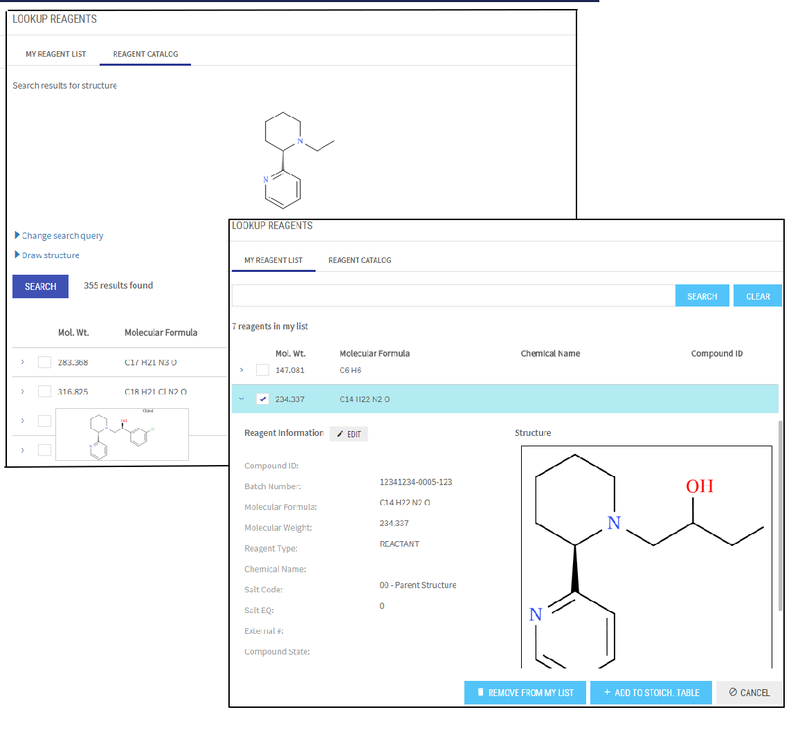 Reagent search can be done by compound attributes such as IDs, compound state or by Structure. “My Reagent list” functionality is avaiable to ensure fast access to frequently used reagents in future experiments. 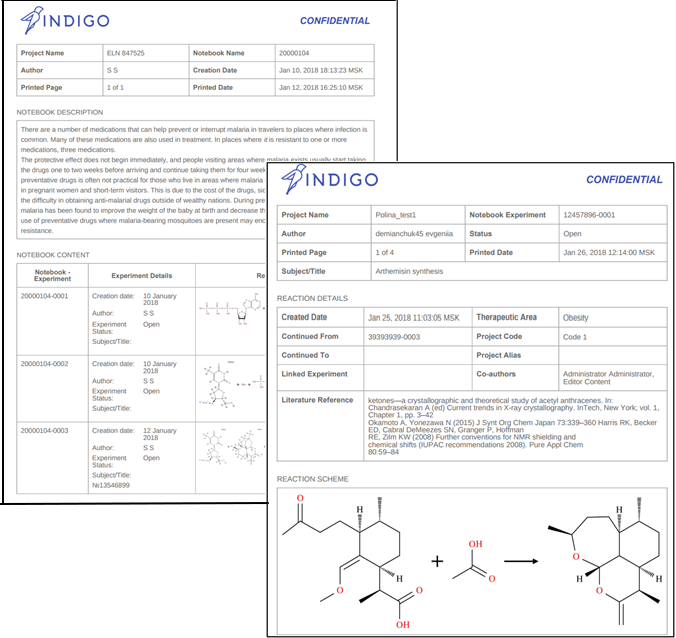 Indigo ELN allows users to review, create, and edit Batches and Batch details: Total Amount Made, Yield%, Stereoisomer code, Purity, Solubility, Hazards, etc. Batches can be added in several ways including Import from SDf option. Batches have unique IDs within the system and can be registered using Compound Registration Service, in which they are assigned Compound IDs. EPAM can provide Compound Registration Service along with Indigo ELN package or integrate the application with a customer service and its database. Users can print out the content of Project, Notebook and Experiment pages. Users can print out experiments contained in Notebooks as well as Projects and Experiments attached as .pdf files. The view of a printed version of an Experiment depends on its template, that is, the set of components it contains. The current components library provides a printed version for any component. Dictionaries collect items that appear in the drop-down lists of the application. Users can create and edit dictionaries in the Dictionaries tab. Dictionaries management is restricted by the corresponding authority in the user Role. EPAM will provide you with customization, integration, support, and maintenance services for Indigo ELN and will price those services based on your individual needs. Major factors affecting the service pricing include: - Environment requirements (operating systems, existing services) - Scope of services to be implemented or integrated - User requirements (additional features or components to be developed for the core version). Please visit the GitHub page for the installation package and documents. For installation instructions, see the Installation Guide. For user manual, see User Guide. Copyright © 2010-2018 LifeSciences unit of EPAM Systems, Inc.